Ever since its legislation in 1951, the 27th of Nissan is the day designated for the annual commemoration of Yom Hashoah, Holocaust Memorial Day. Among the many ceremonies and assemblies held throughout the twenty-four hours of Yom Hashoah, the most nationally unifying observance of Yom Hashoah is undoubtedly the two minute siren which is sounded at 10:00 am. 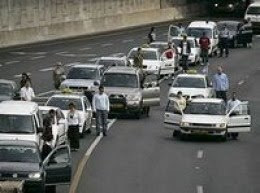 The siren is heard all across Israel, at which time all movement comes to a standstill. There are those, primarily from ultra orthodox communities, who have questioned the halachic legitimacy of such an institution. Among their grievances with this annual commemoration is that it is observed in the festive month of Nissan, a month when mourning and sadness is generally forbidden. Additionally, it is argued that memorializing of the deceased by means of standing at attention during the wail of a siren is a custom of non-Jewish origin – possibly a violation of the prohibition of imitating non-Jewish practices. Indeed, the authentic Jewish approach to honoring the memory of the deceased, especially those who were murdered Al Kiddush Hashem, is by means of Torah study and prayer. Nevertheless, from a halachic perspective, it appears to me that opposition to observing or participating in Yom Hashoah observances is unfounded. Make no mistake, setting Holocaust Memorial Day in the month of Nissan is far from ideal and should not have been implemented in the first place. That being said, however, it is important to note that it is only mourning (aveilut) practices which are forbidden in the month of Nissan, not remembrance (zikaron) ones. One need look no further than the last day of Pesach on which the Yizkor, memorial prayers for the deceased, are recited. Not only does this take place in the month of Nissan, of course, but on a day of Yom Tov, no less! In fact, among the original reasons for the custom for those whose parents are still alive to leave the sanctuary when Yizkor is recited is in order that they be spared from having to witness the extensive crying and wailing which was commonplace during the Yizkor service! It is also noted that the mourning of the sefirat ha'omer period begins in the month of Nissan, the customs of which are even more conspicuous than those of Yom Hashoah. In fact, it is explained that the custom of many individuals to only begin the mourning practices of sefirat ha'omer from Rosh Chodesh Iyar onwards was due to the opposition regarding displays of mourning during the month of Nissan. Nevertheless, the more widespread custom is indeed to begin these public displays of mourning in the month of Nissan, as well. Furthermore, although standing for a siren might be of non-Jewish origin, it is completely permissible to participate in and observe non-Jewish customs which are devoid of any religious meaning. As the Rema writes: "……Non-Jewish customs which are practiced for a reason…or any custom performed out of honor or any other reason is permissible." Rabbi Moshe Feinstein writes similarly: "...therefore, it is obvious in my opinion, that even in a case where something would be considered a prohibited Gentile custom, if many people do it for reasons unrelated to religion or law, but rather because it is pleasurable to them, there is no prohibition of imitating Gentile customs." Finally, one must also bear in mind that deviating from public practice is a violation of the principles of "lo titgodedu" and "al tifrosh min hatzibbur" which teach that one is forbidden to separate oneself from the ways of the community. For a more "Torani" approach to Yom Hashoah, one may want to consider the two minute siren as an opportunity to meditate and focus on Torah related meaning to Yom Hashoah, including using the time for personal prayer. Many individuals, following the recommendation of the Chief Rabbinate, use the sad days of the Tenth of Tevet and the Ninth of Av for Holocaust related commemorations, as well. Personally, I need a Yom Hashoah siren once a year...it reminds what I'm doing here in Israel among the chaos, corruption, and daily threat to my existence. For much more on this issue, see: Holocaust Commemoration and Tish'a Be-Av: The Debate Over "Yom Ha-Sho'a" by Rav Jacob J. Schacter, Tradition 41:2 in 2008.